S (named ess /ɛs/ ,  plural esses  ) is the 19th letter in the Modern English alphabet and the ISO basic Latin alphabet. Shin is the twenty-first letter of the Semitic abjads, including Phoenician Shin , Hebrew Shin ש, Aramaic Shin , Syriac Shin ܫ, and Arabic Shin ش . Its sound value is a voiceless sibilant, or. Voiceless fricatives produced in the postalveolar region include the voiceless palato-alveolar fricative, the voiceless postalveolar non-sibilant fricative, the voiceless retroflex fricative, and the voiceless alveolo-palatal fricative. This article discusses the first two. Samekh or Simketh is the fifteenth letter of many Semitic abjads, including Phoenician Samek , Hebrew ˈSamekh ס, Aramaic Semkath , Syriac Semkaṯ ܣ, representing. The Arabic alphabet, however, uses a letter based on Phoenician Šīn to represent ; however, that glyph takes Samekh's place in the traditional Abjadi order of the Arabic alphabet. The Western Greek alphabet used in Cumae was adopted by the Etruscans and Latins in the 7th century BC, over the following centuries developing into a range of Old Italic alphabets including the Etruscan alphabet and the early Latin alphabet. In Etruscan, the value /s/ of Greek sigma (̔) was maintained, while san (̑) represented a separate phoneme, most likely /ʃ/ (transliterated as ś). The early Latin alphabet adopted sigma, but not san, as Old Latin did not have a /ʃ/ phoneme. Cumae was the first ancient Greek colony on the mainland of Italy, founded by settlers from Euboea in the 8th century BC and soon becoming one of the strongest colonies. It later became a rich Roman city, the remains of which lie near the modern village of Cuma, a frazione of the comune Bacoli in the Province of Naples, Campania, Italy. The Latins, sometimes known as the Latians, were an Italic tribe which included the early inhabitants of the city of Rome. From about 1000 BC, the Latins inhabited the small region known to the Romans as Old Latium, that is, the area between the river Tiber and the promontory of Mount Circeo 100 kilometres (62 mi) SE of Rome. 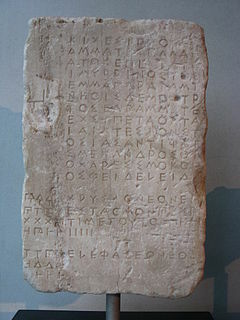 Many local variants of the Greek alphabet were employed in ancient Greece during the archaic and early classical periods, until they were replaced by the classical 24-letter alphabet that is the standard today, around 400 BC. 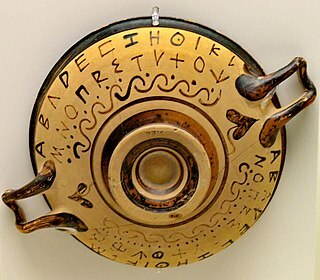 All forms of the Greek alphabet were originally based on the shared inventory of the 22 symbols of the Phoenician alphabet, with the exception of the letter Samekh, whose Greek counterpart Xi (Ξ) was used only in a sub-group of Greek alphabets, and with the common addition of Upsilon (Υ) for the vowel. The local, so-called epichoric, alphabets differed in many ways: in the use of the consonant symbols Χ, Φ and Ψ; in the use of the innovative long vowel letters, in the absence or presence of Η in its original consonant function ; in the use or non-use of certain archaic letters ; and in many details of the individual shapes of each letter. The system now familiar as the standard 24-letter Greek alphabet was originally the regional variant of the Ionian cities in Asia Minor. It was officially adopted in Athens in 403 BC and in most of the rest of the Greek world by the middle of the 4th century BC. *Sowilō or *sæwelō is the reconstructed Proto-Germanic language name of the s-rune, meaning "sun". The name is attested for the same rune in all three Rune Poems. It appears as Old Norse sól, Old English sigel, and Gothic sugil. In German orthography, long s was retained in Fraktur (Schwabacher) type as well as in standard cursive (Sütterlin) well into the 20th century, and was officially abolished in 1941. The ligature of ſs (or ſz) was retained, however, giving rise to the Eszett , ß in contemporary German orthography. P is the 16th letter of the modern English alphabet and the ISO basic Latin alphabet. X is the 24th and antepenultimate letter in the modern English alphabet and the ISO basic Latin alphabet. The grapheme Š, š is used in various contexts representing the sh sound usually denoting the voiceless postalveolar fricative or similar voiceless retroflex fricative /ʂ/. In the International Phonetic Alphabet this sound is denoted with ʃ or ʂ, but the lowercase š is used in the Americanist phonetic notation, as well as in the Uralic Phonetic Alphabet. It represents the same sound as the Turkic letter Ş and the Romanian letter Ș (S-comma). Heng is a letter of the Latin alphabet, derived from h combined with something similar to eng. ↑ "corresponds etymologically (in part, at least) to original Semitic ṯ (th), which was pronounced s in South Canaanite" Albright, W. F., "The Early Alphabetic Inscriptions from Sinai and their Decipherment," Bulletin of the American Schools of Oriental Research 110 (1948), p. 15. The interpretation as "tooth" is now prevalent, but not entirely certain. The Encyclopaedia Judaica of 1972 reported that the letter represented a "composite bow". ↑ Woodard, Roger D. (2006). "Alphabet". In Wilson, Nigel Guy. Encyclopedia of ancient Greece. London: Routldedge. p. 38. ↑ "…τὠυτὸ γράμμα, τὸ Δωριέες μὲν σὰν καλέουσι ,Ἴωνες δὲ σίγμα" ('…the same letter, which the Dorians call "San", but the Ionians "Sigma"…'; Herodotus, Histories 1.139); cf. Nick Nicholas, Non-Attic letters Archived 2012-06-28 at Archive.today . ↑ Stanley Morison, A Memoir of John Bell, 1745–1831 (1930, Cambridge Univ. Press) page 105; Daniel Berkeley Updike, Printing Types, Their History, Forms, and Use – a study in survivals (2nd. ed, 1951, Harvard University Press) page 293. ↑ Order of 3 January 1941 to all public offices, signed by Martin Bormann. Kapr, Albert (1993). 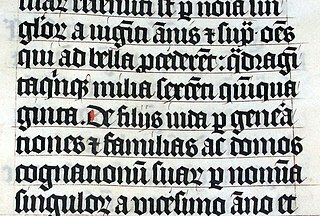 Fraktur: Form und Geschichte der gebrochenen Schriften. Mainz: H. Schmidt. p. 81. ISBN 3-87439-260-0. ↑ "English Letter Frequency". Archived from the original on 2014-05-28. Retrieved 2014-05-21. ↑ Everson, Michael; Baker, Peter; Emiliano, António; Grammel, Florian; Haugen, Odd Einar; Luft, Diana; Pedro, Susana; Schumacher, Gerd; Stötzner, Andreas (2006-01-30). "L2/06-027: Proposal to add Medievalist characters to the UCS" (PDF). Archived (PDF) from the original on 2018-09-19. Retrieved 2018-03-24. ↑ Constable, Peter (2003-09-30). "L2/03-174R2: Proposal to Encode Phonetic Symbols with Middle Tilde in the UCS" (PDF). Archived (PDF) from the original on 2017-10-11. Retrieved 2018-03-24. ↑ Constable, Peter (2004-04-19). "L2/04-132 Proposal to add additional phonetic characters to the UCS" (PDF). Archived (PDF) from the original on 2017-10-11. Retrieved 2018-03-24. ↑ Ruppel, Klaas; Aalto, Tero; Everson, Michael (2009-01-27). "L2/09-028: Proposal to encode additional characters for the Uralic Phonetic Alphabet" (PDF). Archived (PDF) from the original on 2017-10-11. Retrieved 2018-03-24. ↑ West, Andrew; Chan, Eiso; Everson, Michael (2017-01-16). "L2/17-013: Proposal to encode three uppercase Latin letters used in early Pinyin" (PDF). Archived (PDF) from the original on 2018-12-26. Retrieved 2019-03-08.